Zon-Kuthon（pronounced ZONN-koo-THON）［1］ possesses one of the most twisted and evil minds in the multiverse. His position as god of pain is well earned, and he has been the root of countless tortures, murders and worse throughout time. At the beginning of time, Zon-Kuthon was known as Dou-Bral, a good deity who shared the portfolio of beauty, love and the arts with his half-sister Shelyn. Dou-Bral abandoned Golarion for the dark places between the planes, though, and was tormented there and possessed by an alien being. Upon returning to reality, Dou-Bral as he had been known was gone, replaced with the twisted, malevolent soul known as Zon-Kuthon. When Shelyn saw that her brother was forever changed, and not for the better, the two battled, her pleas and tears met with a violence foreign to the Dou-Bral she knew and loved. Shelyn finally wrested the golden glaive the two had shared a symbol of their power from her twisted brother's fingers, establishing an tenuous truce, held in place more by silence and avoidance than any desire to actually coexist［2］. Seeing the crimes Zon-Kuthon committed in Golarion, Abadar knew that he must be punished, and made a bargain with the evil god. Zon-Kuthon agreed to go into exile on the Plane of Shadow for as long as the sun hung in the sky in exchange for an item from the First Vault. This imprisonment was not meant to be over as soon as it was, though, and when the sun stopped shining upon Golarion during the Age of Darkness, Abadar honored his deal, giving Zon-Kuthon the first shadow, which The Midnight Lord has used to craft evil creatures from his realm of Xovaikain. Zon-Kuthon has little concern for the dealing of other deities. As long as he can play with his many toys, The Dark Prince has no need for any alliances, wars, or diplomatic dealings. While often the target of vengeance from Golarion's good deities, Zon-Kuthon himself does little to instigate conflict. That said, he is not above torturing followers of other faiths, and does so whenever possible. The only one safe from his evil ways is his sister Shelyn, though he grants no such immunity to her faithful. As Dou-Bral, Zon-Kuthon was known for his beauty, but his body now resembles a work of art only to those like-minded individuals who find pain and torture to be the pinnacles of existence. Pale, gaunt, and often hairless, Zon-Kuthon is often depicted wearing tight, sexualized leather clothing, exposing his many open wounds and body modifications. His lips have been removed, giving him a bloody, haunting grin, and hooks and piercings contort his face into reviling expressions, enhanced by the crystal which rests in the cavity where his left eye once sat. Atop his scalp, a vertical crown of spikes pulls his skin into a disturbing sunburst, and the back of his skull is completely gone, revealing his brain. His hands ends in long, knife-like fingernails. Zon-Kuthon and his followers are more concerned with pain than they are symbols of the faith, but clerics are known to summon shadows and erinye to do their bidding. A lasting reminder of Zon-Kuthon's decadence, the god's herald is a tormented remnant of the spirit-wolf who sired Dou-Bral and Shelyn. 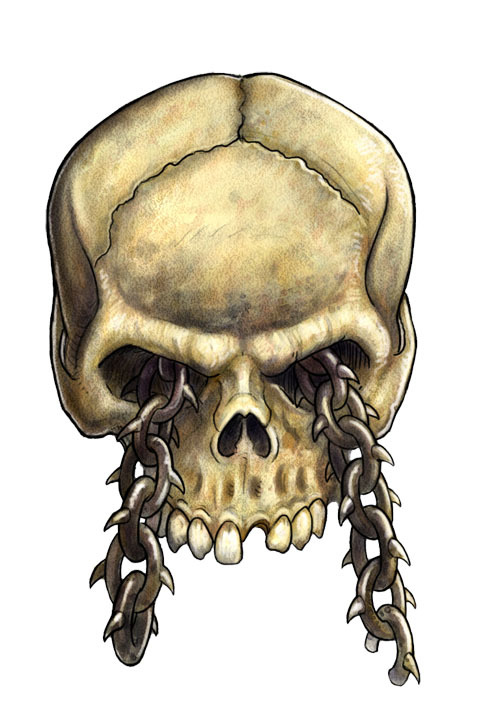 This chain devil is covered in wounds, which it inflicts upon itself, and which transform into other organs, each performing their normal function. Dominik is a vampire who was tortured and mutilated by Kuthites who is plagued with the inability to quench his undying thirst due to a permanent wound which removed his digestive organs. There is no centralized church of Zon-Kuthon, and independent churches are content to cause and revel in the small bit of pain and misery they are able to inflict upon their corner of Golarion. As a lawful faith, however, each sect has a clearly-defined hierarchy, based on physical power, endurance, willingness and ability to endure pain, and similar elements related to church practices. Kuthites run the gamut in their origins and motivations for joining the faith, whether they be evil sadists, demented masochists, or those whose spirits are so wounded that only overwhelming pain distracts them from their sorrows. Clergy tend to take their fervor for pain and agony to higher levels than lay believers, but are also experts at blending in with normal society. Most clergy of Zon-Kuthon are clerics, and the number of blackguards is limited at best. Temples of Zon-Kuthon are, for all intents and purposes, torture chambers, and often function as such even when not in use for religious ceremonies.［7］ Because of the unique and often disapproved practices which take place in the church, temporary temples are kept fairly simple with decorations brought in specially for services. In more remote areas, believers might make impromptu shrines in places where violence and pain have occurred. Kuthites are not bookish worshipers, often choosing to experience their faith rather than study it in a text. The tenets of Zon-Kuthon's faith are detailed in this grisly book, written in blood on pages of flayed skin. ◇The faith of the Dark Prince has few holidays but, Zon-Kuthon being the god of darkness and all, regular worship generally occurs on nights of a new moon. In an effort to concentrate the sensation of pain, this practice allows the wealthiest and luckiest of Kuthites to have their limbs and non-vital organs amputated so that they remain a helpless head and torso, destined to live the rest of their lives as the subjects of limitless torture. This annual sacrifice lasts eleven days and often involves using the victim's entrails or cries of pain as soothsaying tools.